The InterWeighing2006 that was held in Hangzhou Peace International Conference & Exhibition Center between May 17~19, 2006 has gained unprecedented success due to the exhibition space, number of exhibitors and visitors both at home and aboard, presentation effect compared with the cases in the past years. More than 190 exhibitors come from America, Canada, Germany, Italy, Spain, Japan, Korea, India and Mainland China including Taiwan and Hongkong. The exhibition area for Interweighing2006 was 10000 square meters with 450 of standard booths. During the period of the exhibition, the 2006 Annual Meeting for China Weighing Instrument Association, the Sixth Seminar on China National Weighing Technology and the Presentation Meeting on New Weighing Technology and New Product were convened. 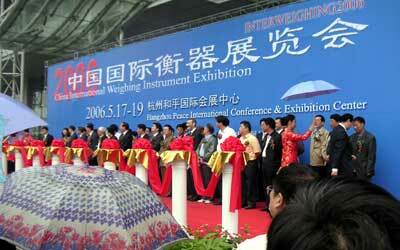 At 9:30am of May 17th, the opening ceremony for Interweighing2006 was held formally on the central square of the Hangzhou Peace International Conference & Exhibition Center. Mr. Liu Xiaohua, secretary general of CWIA, chaired the opening ceremony and Mr. Cao Lipping, vice-president of CWIA, delivered his speech for the opening ceremony. Mr. Ye Rongbao, vice director of Zhejiang province’s Congress; Mr. Wang Shicheng, vice president of China National Light Industry Council; Mr. Hu Nan, president of China Light Industry Invest Association; Mr. Matin Birdseye, director of regulation of National Weights and Measures Laboratory of UK; Mr. Kim Myong Dong, Ing manager of Korea Kuryonggang Trading Co.; Mr. Lin Yufeng, president of Taibei Weighing & Measurement Commercial Association; Mr. Luo Qun, president of China & Korea area of Mettler-Toledo; Mr. Lin Disheng, general manager of Asian & Pacific area of HBM; and Mr. Zhang Jingyao, president of CWIA cut the ribbon for the opening ceremony. A delegation of 30 people headed by Mr. Lin Yufeng, president of Taibei Weighing & Measurement Commercial Association, visited the Interweighing2006 on their special trip and presented a tablet for memory to China Weighing Instrument Association. The InterWeighing2006 was attached importance by the companies and distributors at home and abroad. The visitors to this exhibition came from 50 countries or more such as India, Korea, Thailand, Japan, America, Russia, Malaysia, South Africa, Israel, Iran, UAE, Turkey, Italy, Australia, Ukraine, Singapore, Spain, Indian, Canada, Sri Lanka, Germany, Bulgaria, Pakistan, Philippines, Chile, Columbia, Egypt, Brazil, Netherlands, Burma, Britain, Mexico, Kenya, Mongolia, Argentina, Viet Nam, Latvia, France, Liberia, Bengal, Syria, Austria, Poland, Tunisia, Costarica, Peru, Finland, New Zealand. The InterWeighing2006 lay out many new product, new technology that were developed near years, various weighing apparatus appearing the latest achievement and the current growing level of weighing industry. Many foreign enterpriser gave their high appraise to our weighing development. This exhibition attracted much attention from many weighing users, some exhibitors signed sale contract with customer, The Interweighing2006 made good function on technique communication, publicizing new products new manufacture. The InterWeighing2006 closed successfully. We will be active in planning and preparing for the InterWeighing2007. The InterWeighing2007 will be held on the Shanghai Everbright International Exhibition Center in April, 17~19 2007. All of our friends both at home and abroad in the weighing industry, new and old are warmly welcome to join the InterWeighing2007.